The Eagles will have their hands full with Drew Brees this Sunday. It's always possible the Eagles will mount a stirring, save-the-season effort, which would have been a much better idea three or four weeks ago. 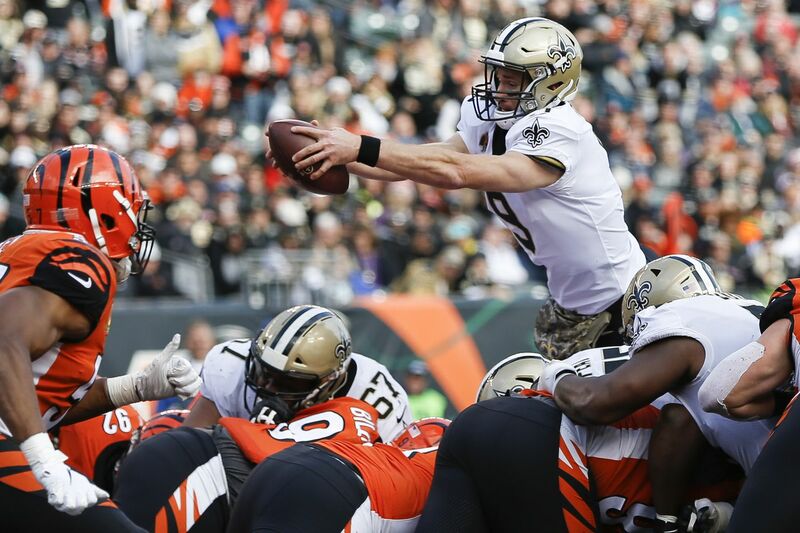 Even if they do come out looking like the team they were supposed to be this season, it's hard to envision how this becomes a win, unless Drew Brees calls in sick because his left tackle, Terron Armstead, is sidelined with a pec tendon injury. The Eagles haven't scored as many points in a game this season as the Saints are averaging (36.7), and the Eagles won't have either of their starting corners. I could go on and on with a bunch of other situations and stats that favor New Orleans, but there really isn't much point. Can the Eagles beat the Saints on Sunday? Sure. This is the freaking NFL. On any given Sunday and all that jazz. Will they? Don't see it happening. Everything the 4-5 Eagles need to do to slow down the freight train that is the Saints offense — force some turnovers, get off to a fast start, tackle well and limit Michael Thomas and Alvin Kamara's yards after the catch, keep the ball away away from Drew Brees with a ball-control run game — are things the Eagles haven't been able to do. The Eagles’ defense will have to contain the Saints’ offensive weapons, including running back Alvin Kamara. They have just seven takeaways, third fewest in the league, in nine games. The Saints have turned the ball over just eight times, the fifth-fewest giveaways. The Saints have racked up touchdowns on their first two possessions in both of their last two games. If that happens again Sunday and the Eagles can't keep pace, this could get ugly in a hurry. The Eagles' backs are to the wall, so the speak. They haven't played like a good team, and I'm not sure they are, but they haven't flat-out delivered a turkey and I don't think they will in New Orleans. If the Eagles do get blown out, I'd imagine the team's collective psyche will take a fateful blow. The Saints certainly have the firepower. They scored at least a field goal on each of their first nine possessions in last week's 51-14 slaughtering of the Bengals. There isn't much left to say that hasn't already been said about 39-year-old Drew Brees. The quarterback is playing at a consistently high level, and he has explosive skill-position players who make his job easier. Alvin Kamara is a dual-threat nightmare. Mark Ingram is almost as dangerous. Michael Thomas has caught a remarkable 90 percent of his targets. The Eagles secondary, down three starters, will have its hands full. Jim Schwartz's defense might have caught a break when left tackle Terron Armstead was declared out earlier this week. Michael Bennett and the D-ends need to do whatever they can to disrupt Brees' rhythm, because sacks – he's been dropped only nine times – have been hard to come by. The Eagles’ defensive line needs to get pressure on Drew Brees. The Saints defense plays second-fiddle to the offense. The disparity in yards allowed on the ground — a league-best 80.1 a game — and yards allowed through the air – a second-worst 296.1 a game – stems from opponents' having to play catch-up often. New Orleans defensive coordinator Dennis Allen employs a multiple front. End Cameron Jordan (six sacks) is the linchpin up front. If the front four can't get pressure, the back end is susceptible. Cornerback Eli Apple came via trade last month, but he can be exposed. Marshon Latimore is better on the other side. The Eagles will likely need to score more than the 22 points they've averaged this season to keep pace. I have them eclipsing that number, by one. It won't be enough. This didn't look like a win when the schedule came out — it certainly doesn't look like a win given the way the two teams are playing. I picked the Saints to win the Super Bowl this season and like the roster they have assembled, although the offense is even better than expected. The Eagles are holding opponents to 14.75 points in their four wins this season. They'll be lucky if they hold the Saints to that total in the first half. Simply said, the Eagles cannot play like they have this season and expect any chance of competing with New Orleans. This can't be a game in the teens and 20s. The Eagles need to score with the Saints to beat them. That's going to require the Eagles to play better in the first quarter (they have only 21 first-quarter points this season) and finish their drives. They've topped 23 points only twice this season. On defense, the Eagles know Drew Brees is going to make plays and move the ball down the field — especially with weapons such as Michael Thomas, Alvin Kamara, and Mark Ingram. What the Eagles need is to hold the Saints to field goals instead of touchdowns, and try to get a turnover or two to steal a possession. They're playing with their second-string cornerbacks, and that's a tough proposition against Brees, although the absence of left tackle Terron Armstead could help the Eagles pass rush. I don't consider this a must-win game for the Eagles because their playoff hopes rest on winning the division and beating Washington twice, but the Eagles need all the wins they can get at this point. I don't see it happening Sunday.